The Final Chapter For A Trusty Bookmobile? Those rolling reading rooms are becoming scarce — too costly and outmoded, some say. The bookmobile in one New England town just broke down, and residents are wondering if it's time to shelve it in the history section. The broken-down Cobleigh Public Library bookmobile sits idle at a storage facility in Lyndonville, Vt. Supporters are raising money to put it back on the road. Across America, libraries used to reach out to readers by sending bookmobiles into school parking lots, street corners and rural byways. Now, those rolling reading rooms are becoming scarce — too costly and outmoded, some say. 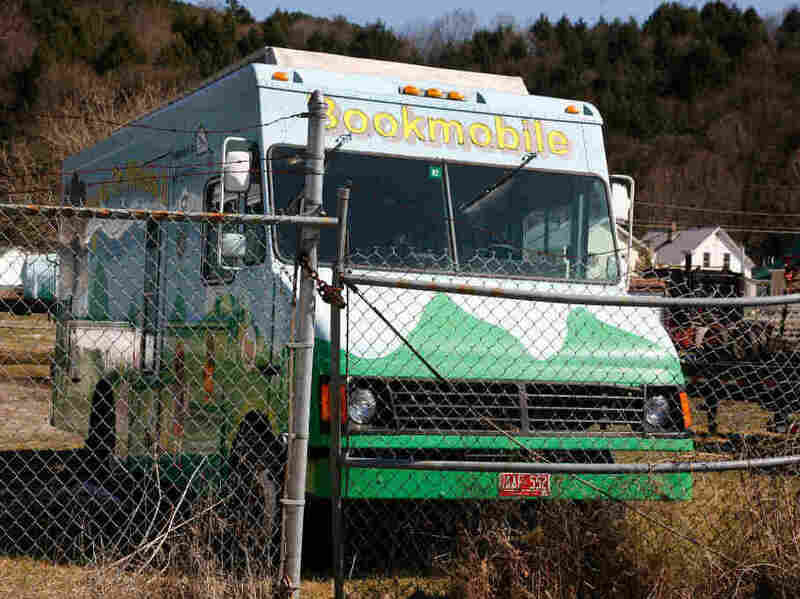 One town in northern New England just lost its bookmobile. The Cobleigh Public Library in Lyndonville, Vt., had managed to keep its van rolling until about a month ago, when it died. If you want to hear first-hand what it's like to go through a whole month without a single visit from the bookmobile, just ask the preschoolers at Stay and Play, a daycare center. "We miss the bookmobile," one child says. "Yeah, we miss the bookmobile until it comes here," says another. Now that the bookmobile has broken down, librarians have to bring books in their own cars for story hour. Daycare provider Anneka Bickford says it's not as thrilling as having a big, brightly painted vehicle roll into the driveway and open the doors so the kids can browse and choose their own books. "It's getting the children involved with what a library is, how to check out books [and] how to return books," Bickford says. "They would do programs with the children; singing, dancing, themes — so it's the excitement of the library that we can't give to the children." It's not the first bookmobile to bite the dust. Over the years, Vermont's large fleet has dwindled to three or four. Lyndonville's head librarian, Cindy Karasinski, says replacement costs have skyrocketed. "The first bookmobile was out of the dump, it was a plumber's van out of the dump," Karasinski says. New bookmobiles are expensive; just one of them cost $90,000, she says, "so that seems not the way we are going to go." Sadly, Karasinksi says, the kind of grants that used to fund bookmobiles have all but dried up. Yet there was a time when rolling libraries were all the rage, says 92-year-old Eleanor Simons, who drove one around back in the 1940s. They were even a little scandalous for single librarians, Simons says. Her great aunt called it "intimate." "Well, the idea of riding around all day with a strange man, that's what she thought was intimate, of course," Simons says. For Simons, it was a dream job. She hopes the Cobleigh bookmobile gets a second chance. Not everyone does. Some in town feel the bookmobile has served its purpose and become a financial burden instead of an asset. Karasinski says the final decision will be made by the library board — with citizen input.